Think of the Studio 192 like a mixer for a moment. With UC Surface running in the background it mixes all the playback streams and sends them to Mix Out 1/2. With Studio One active and you do not have Cue Mix enabled on the master or sub output, your audio will play out of UC Surface Mix Output 1/2. What is most likely happening is that when you change sample rates Windows will reset the output audio devices list in the playback tab in Windows Sound Playback devices. Microsoft sorts devices alphabetically. Make sure you have Mix Out 1/2 set as Default Output. If you change the sample rate, the default will change to HP 1 and you'll need to change the default back to Mix Out 1/2. In Studio One make sure you have Cue Mix Outs enabled in the Output Tab in Audio I/O settings. This will result in UC Surface to bypass the mixer and allow Studio One to take over Mix Control of the outputs. Then you'll hear audio out of the sub outs and your headphone mix will be controlled by Studio One. 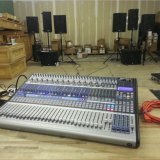 I hear strange audio coming from my Studio 192 when it wakes from sleep, what's going on? Why do I hear audio with my volume knob turned all the way down with my Studio 192?